Jobs could be at risk at the new operator of the West Midlands rail franchise, the RMT union has warned. 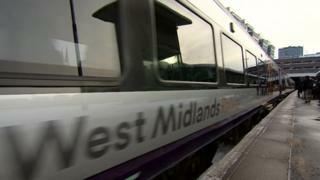 West Midlands Trains Ltd took over from London Midland on Sunday. But in a letter last month to London Midland staff outlining how their jobs will transfer across, the operator suggested it might outsource cleaning services and train maintenance. All proposals will be subject to full consultation with staff and unions, West Midlands Trains confirmed. West Midlands Trains is a joint venture between Dutch firm Abellio and Japanese partners, with the deal leading to almost £1bn of investment and new, longer trains. The RMT union said it fears the operator will also "do away with" train guards, despite assurances in the letter that two members of staff will be retained on trains. Ken Usher, from the RMT, said: "We believe they will do the same as what they have attempted to do with Merseyrail and do away with the guard there, and we believe they will do the same as what they are attempting to at Greater Anglia and do away with the guard there." When it was awarded the franchise in August, Abellio said London Midland's current workforce of 2,400 would move across. In the letter to staff - seen by the BBC - the operator also said some administration work could be transferred to centre to Scotland, already used by parent company Abellio. Jan Chaudhry-van der Velde, managing director of West Midlands Trains, said: "We've already said we will keep two people on every train. "There will be a driver and a second person on the train. Now, obviously we need to engage with the unions regarding future method of operating and the future staffing." The franchise covers routes from London Euston to Crewe, and Liverpool to Birmingham as well between Northampton and London Euston - connecting lines between Bedford and Bletchley, between St Albans and Watford and Crewe to London - via Stoke-on-Trent, Stafford, Lichfield and Milton Keynes.